Towngate from the former Roundacre roundabout. For Basildon to succeed it was crucial that the main shopping centre be constructed at the heart of the New Town. For this reason the shopping centre was developed at a point geographically between the two existing towns of Laindon and Pitsea. The development corporation were keen to promote the location and in 1956 a large illuminated billboard with the words "Basildon Town Centre Site" was erected in full view of passing trains. Development began in the 1950s with design emphasis firmly on pedestrianised shopping, and by 1958 the first shops were open to the public. The same year saw Basildon market open, followed in the early 1960s with the main Town Square itself taking shape. Marks & Spencer, the A.B.C. 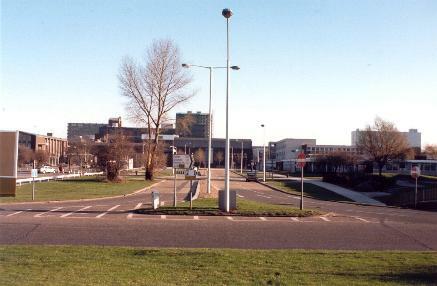 Cinema and Northgate House, along with the Multi-Storey Car Park were all added in the 1970s as Basildon continued to grow. Over the years further development continued with the opening of the Eastgate International Shopping Centre in two phases in the 1980s. This involved diverting Southernhay and thus created further pedestrianised shopping. More recently during 1998/1999 land at the western end previously occupied by the Council's temporary offices has been developed as Westgate Park Shopping Centre.